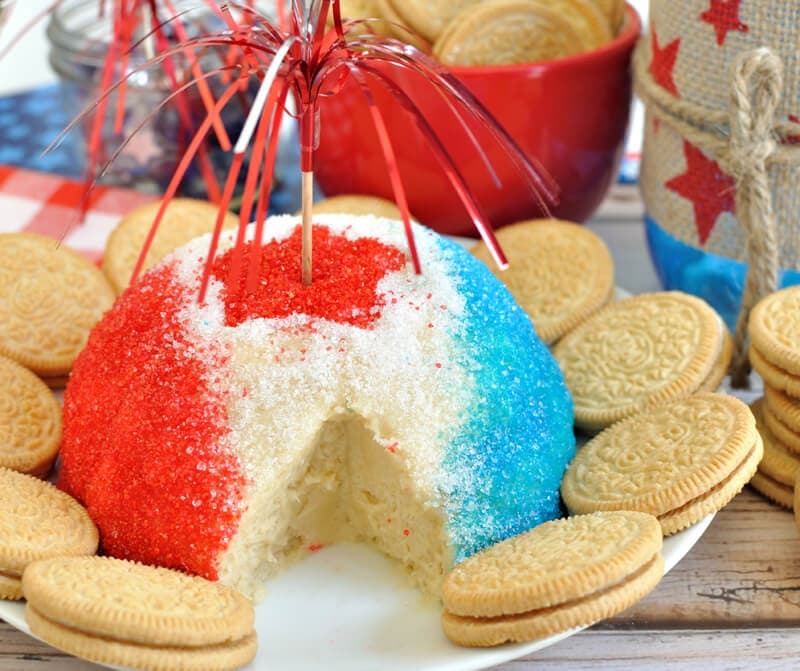 I had so much fun making this Red White and Blue Golden Oreo Cheese Ball. Really, how cute is this dip? 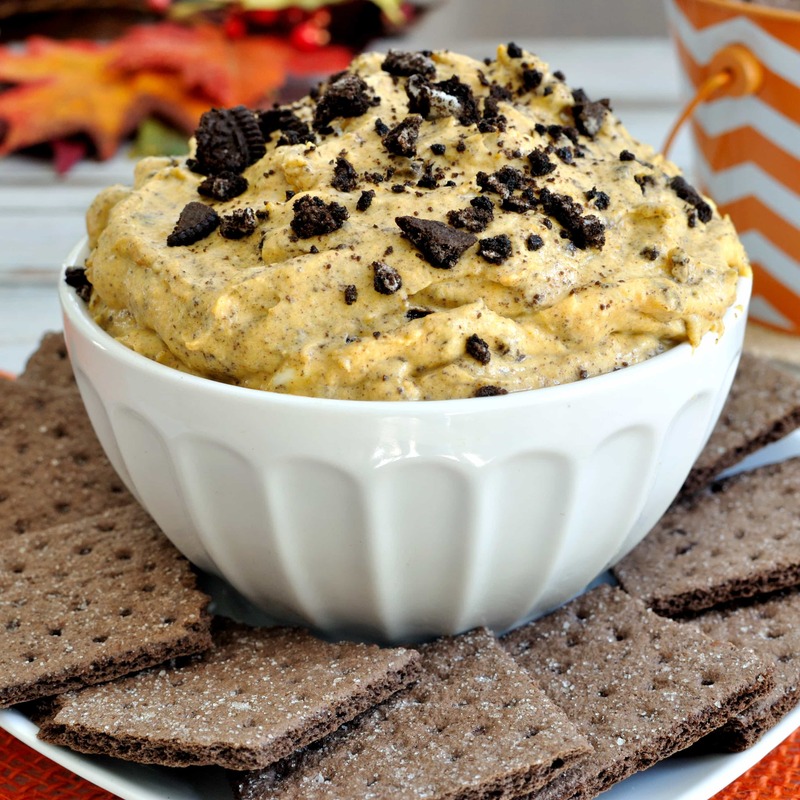 Oreos are the quintessential American cookie so golden Oreos were the perfect choice for this festive cheese ball. 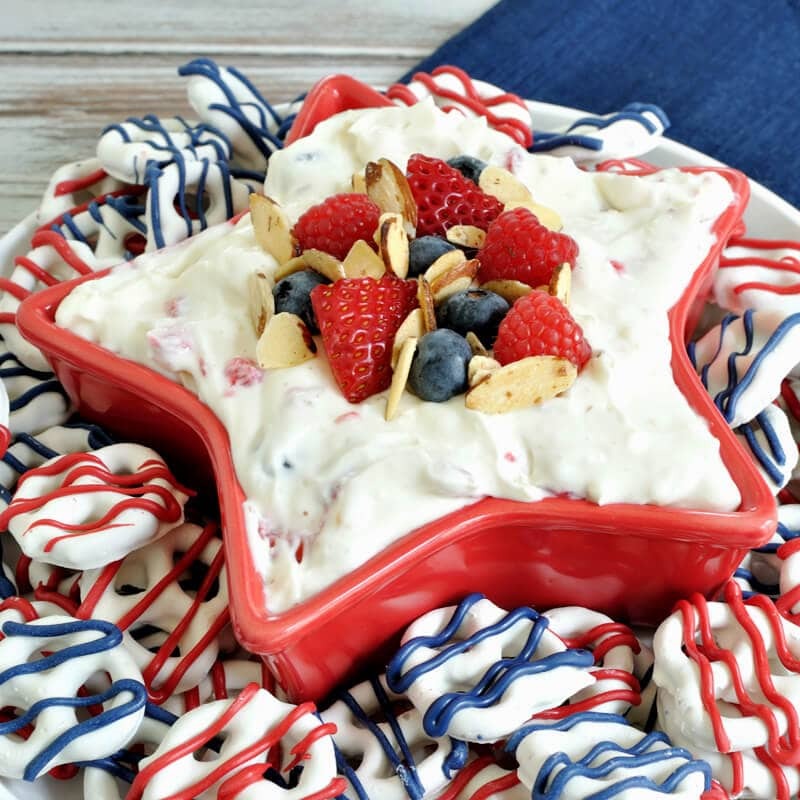 Decorated with patriotic colors and a shimmering star, this dip is an easy dessert recipe for the 4th of July, Memorial Day, or Labor Day. Wow, last week proved to be quite an experience for my husband and I. On Tuesday night, we were backing into our driveway when we heard a loud noise and then saw a car slam into the parked car just across the street from us. My husband threw the car into park and jumped out to check on the driver while I was still trying to comprehend what had just happened. I soon followed and ended up calling 911 just as all of our neighbors starting coming outside to see what they had just heard. Long story short, a driver had blacked out and hit one of our neighbor’s cars and bounced off of it into the other neighbor’s car. Everyone including the driver was OK, thank God! A few seconds earlier and we would have been in the direct path of the out of control car. Scary stuff! Then on Thursday night, we were on our way home from a baseball game as a line of very strong thunderstorms moved into our area. We were about 10 minutes from our house on the Interstate when the rain and wind hit so hard that we felt the car move and we couldn’t see a foot in front of us. All we could see were blinking blury lights of all the cars in front of us trying not to wreck. Somehow we managed to make it home safely. As we pulled into our neighborhood, we could see branches all over the place and trash cans that had been put out to the curb for pickup were flipped over in the middle of the street and it looked like a river running down the side of the street. Thankfully, we had escaped significant damage and never lost power, but a lot of our city was not as fortunate. It wasn’t until Friday morning that I realized just how bad the storm was. Traffic lights were out all across town, a couple hundred tousand were without power, trees had smashed into houses and cars, and it was a disaster zone. They said we had 80-100 mph winds with horizontal, torrential rainfall. Needless to say, I was ready for a relaxing weekend! 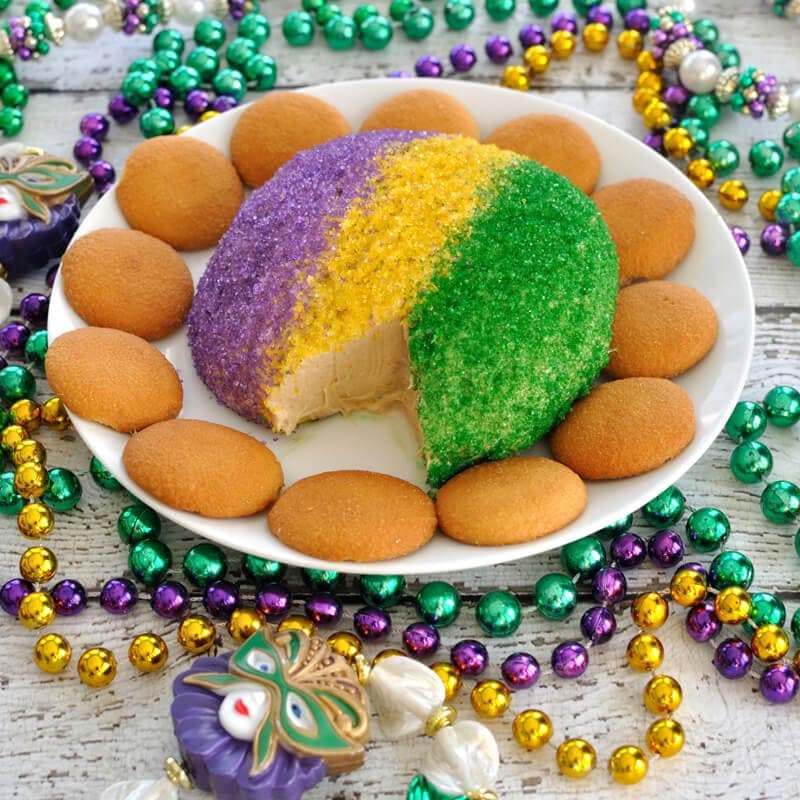 My idea for this Golden Oreo Cheese Ball initially started with just coloring the cheese ball in thirds with red, white, and blue sparkling sugar like I did with my Mardi Gras King Cake Cheese Ball. Then I decided I wanted to incorporate a star into the decoration. I placed a small star shaped cookie cutter on top of the cheese ball and made a tiny mark with a knife on each side. 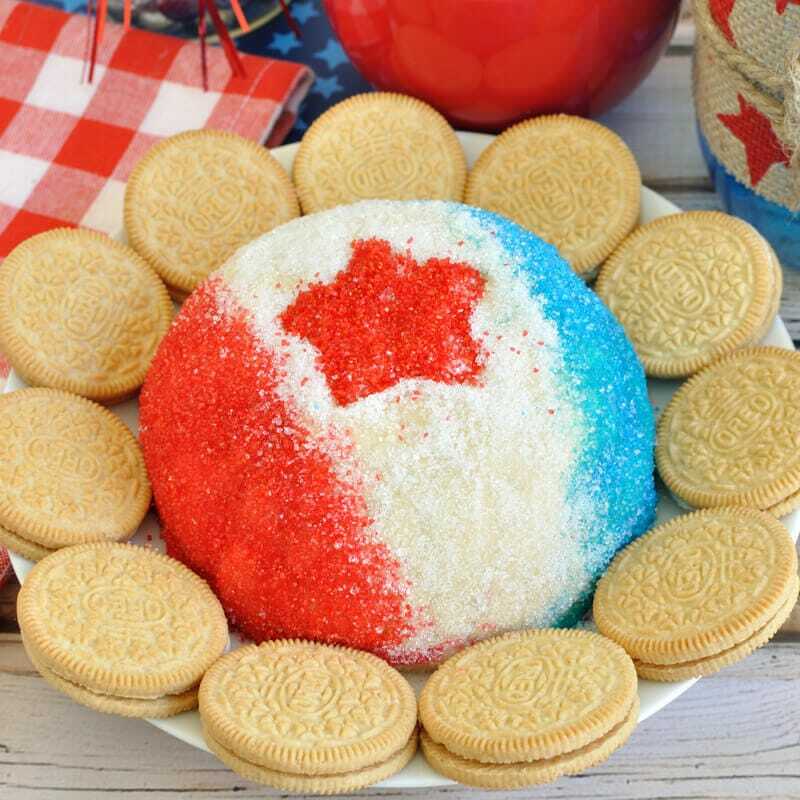 I then removed the cookie cutter and sprinkled the red sugar covering one side of the cheese ball up to the line I made and repeated on the other side with the blue sugar. I then sprinkled the white sugar in the middle. I lightly layed the cookie cutter back on op (taking care not to press too hard) and sprinkled red sugar inside the cookie cutter. Lifting the cookie cutter up left a nice red star shape. I know it sounds like a lot, but it is really simple. For an extra festive look, add a cupcake topper in the center of the star. I used a fun, foil firework topper. 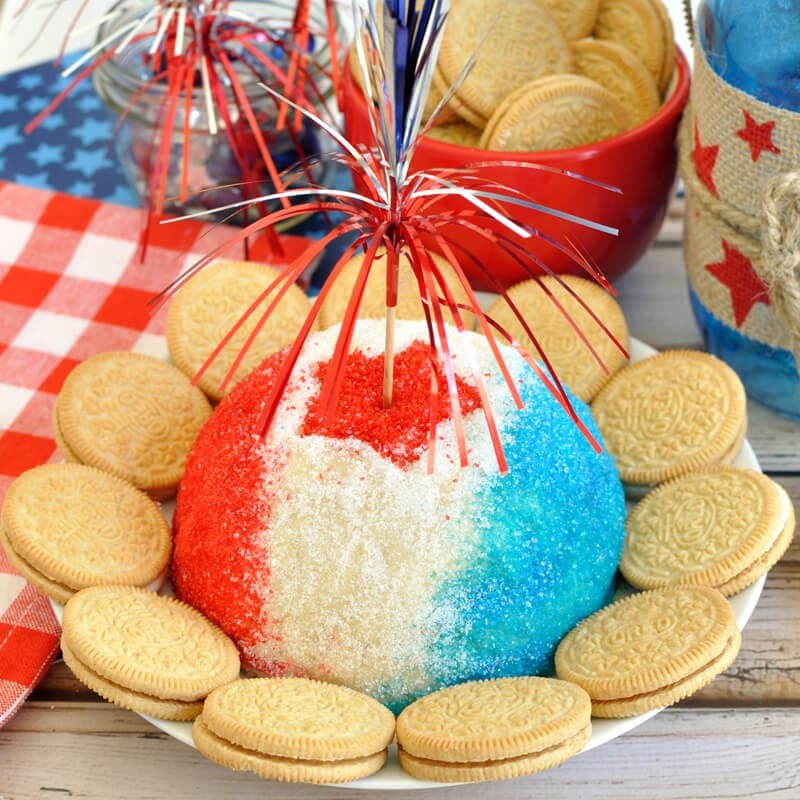 Doesn’t the firework effect look cool on top of this Golden Oreo Cheese Ball? 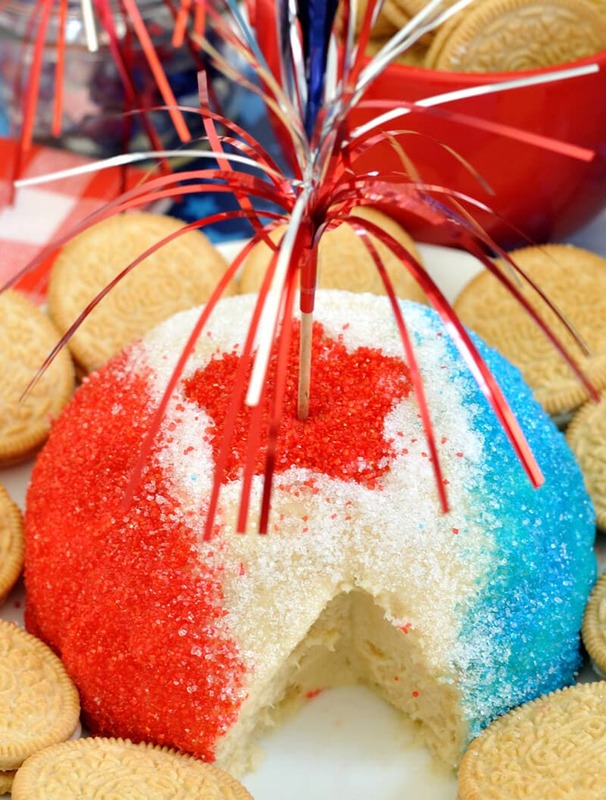 Oh and did I mention there are crushed golden Oreos inside the cheese ball? Yep, there are! You’re welcome! 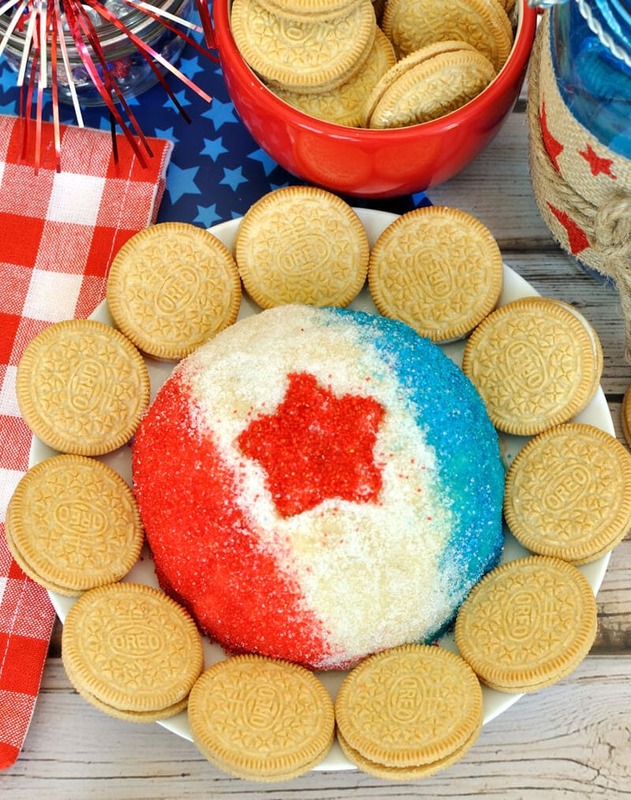 Easy dessert for the 4th of July, Memorial Day, or Labor Day. 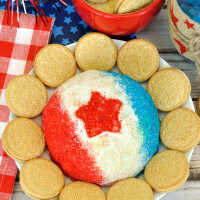 This Red White & Blue Golden Oreo Cheese Ball is a fun, patriotic party dip. Place Oreos into a food processor and process until fine crumbs form. Set aside. Using a mixer on medium speed, whip together the cream cheese and and butter until mixture is smooth and creamy. Slowly mix in powdered sugar. Add in vanilla and crushed Oreos and mix until combined. Line a small bowl with plastic wrap. Place cream cheese mixture into plastic lined bowl. Cover and refrigerate at least 2 hours. Once firm, carefully remove cheese ball from bowl and place onto a wax paper lined flat surface. Lightly place a small star shaped cookie cutter on top of the cheese ball. I used a knife to make a small mark on both sides of the cookie cutter to create sections so I knew where to change colors. Remove cookie cutter. Sprinkle one color of the sparkling sugar onto each of the 3 sections. From left to right, I did red first, then white, then blue. Place star cookie cutter back on top. Using the color that you want for the star, sprinkle the sugar onto the inside of the cookie cutter until covered. Carefully remove cookie cutter and you'll have a star.